What Are Lawn Mower Lifts? Are Lawn Mower Lifts Necessary? Riding lawn mowers are tremendous time saving pieces of equipment. If you have to mow more than the smallest of lawns a riding mower turns a back breaking labor into an almost enjoyable spin around the yard. But while riding mowers are much easier to use than push mowers, they are much harder to properly clean and maintain. Accessing the underside of a push mower to clean clogged grass or change the blades is relatively easy. But the larger engines and transmissions on riding mowers make them much heavier. Certainly they don’t require a major tool like a car lift to work on them. But to properly lift them up for maintenance – without breaking your back – you need a lawn mower repair lift. 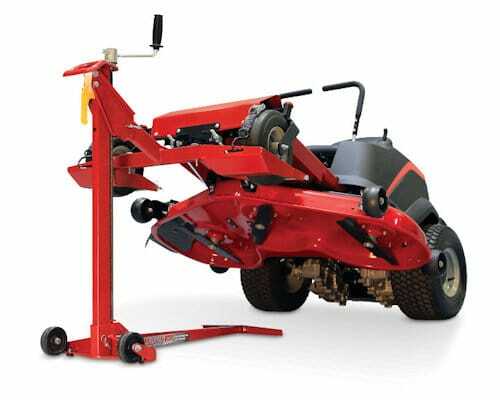 There are a variety of models of mower lift available, each with various strengths and weaknesses. So we decided to review the top models, to help you make an informed decision before you buy one. Click the buttons above for detailed information about each unit, or read on for our review of each of the top 3 Lawn Mower Repair Lifts. Our top choice for a lawn mower jack in this review is the Dragway Tools 1500 LB Air Hydraulic Lift. 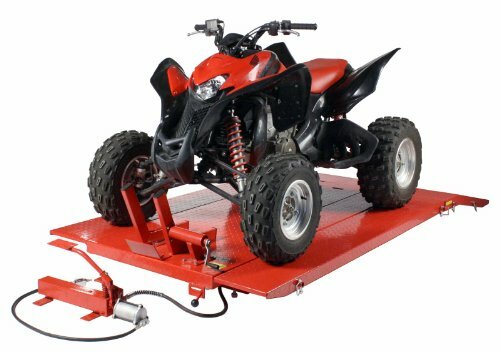 This is more than just a lawn mower lift as it is able to hold motorcycles, ATVs, and more. This lift is the best on the market and none compares with its wide variety of features. The first thing you will notice about the Dragway Tools lift is how big it is. The large platform is 55.5 inches wide by 115.5 inches long, providing ample space to work on any size mower. The platform was well designed with two extensions that increase the working space, but also are removable to make it easier to work on smaller sized machines. The lift is powered by a heavy duty foot pump that allows for easy raising and lowering of the platform. So far the Dragway Tools mower lift has only received positive reviews. People who used the product mentioned that it was “well built” and “better than expected for the money.” If you are looking for the best lawn mower lift on the market and have the budget for it, this is the one for you. Overall the Dragway Tools 1500 LB Air Hydraulic Lift is an excellent product, and it can be had at a reasonable price. 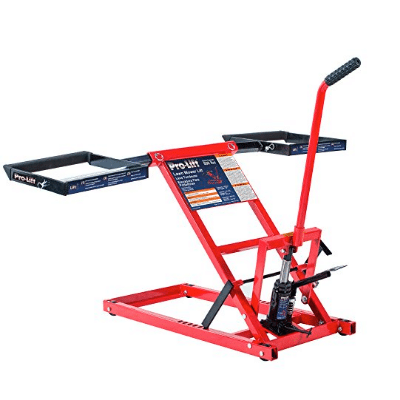 The 2nd best option in our roundup of lawn mower repair lifts is the MoJack EZ Max Mower Lift. This jack is a highly rated, compact, hand-powered unit that brings together functionality and affordability into one product. The Mojack differs from the Dragway Tools lift in that it doesn’t lift the entire mower into the air. Instead, it lifts up one set of wheels so you have access to underneath the mower. The other way that it differs from the other lift is that it is hand-powered. The mower wheels can be raised or lowered by a crank that is hand-turned, or even with a powered drill. The weight limit is 450 pounds so it should be able to handle just about any mower. Not only does the MoJack EZ Max Mower Lift have great reviews, it has tons of them. Since the debut of the lift, it has received over 200 five star reviews. Testers of the product said things like “this jack is everything it claimed to be and more” and “very nice jack for the money”. The MoJack Mower Lift is an excellent product, and the low price makes it even more attractive. Great for any maintenance - ideal for repairs, blade sharpening, belt Replacement and debris removal. Fits most Tractors & mowers - fits most residential tractor and ZTR mowers. 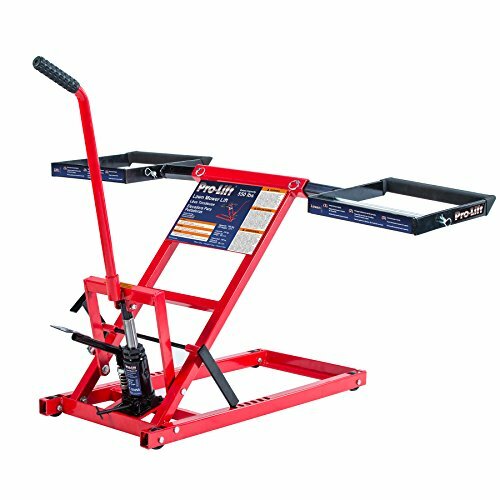 The third item in our review of lawn mower lifts is the Pro-Lift T-5355A Lawn Mower Lift. 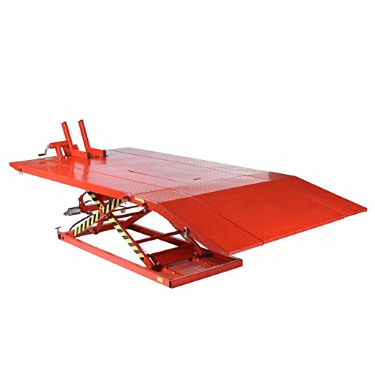 This lift is another excellent budget alternative to the expensive Dragway Tools jack. In fact, it is the most affordable lift in this review. The Pro-Lift is very similar in design to the Mojack lift. Instead of lifting the entire mower in the air, it is designed to just lift two wheels, providing access to the blades. The big difference between the two is the mechanism by which the lift is powered. Although they are both manually powered, the Pro-Lift is raised up by a foot pedal. Max weight capacity for this lift is 350 pounds. 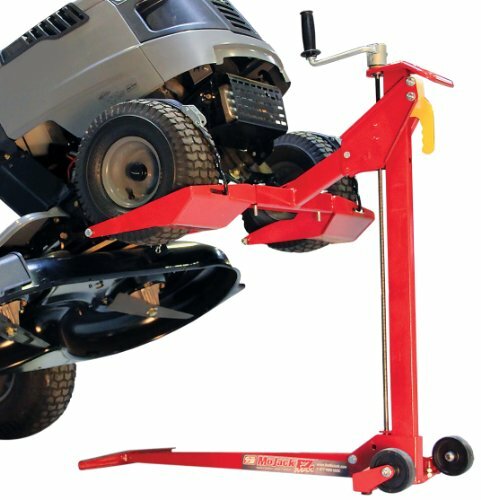 The lift has a maximum height of 23 inches off the ground, which is plenty to perform regular maintenance on your mower. Many features are included with this product such as the adjustable arms that can be positioned to hold just about any mower. In addition, the platforms are rubber padded to prevent damage to your mower. While still well-rated, the Pro-Lift does not receive as many good reviews as the other two lifts in this review. In general, most customers were happy with their purchase, but some were not impressed with the quality. But the ridiculously low price makes up for the lower quality. When you need to service a push lawn mower, accessing its parts is as easy as turning it over on its side and getting to work. Now, if you try that same technique with a riding lawn mower or a zero turn mower, you could really hurt yourself. These machines are heavy. They weigh hundreds of pounds and require much more than a little elbow grease to get them accessible for servicing at home. For this purpose, a lawn mower lift will do the work for you. These tools are an investment into the ability to do your own repairs on your equipment, eliminating the need and cost of bringing them into a repair shop. They allow the user to elevate the mower for easy access to all its otherwise unreachable parts. While some people may insist that it’s just as easy to use cement blocks, car ramps or even other kinds of lifts to work on a lawn mower, the safest and easiest way to elevate a mower for repairs is by using an actual lawn mower lift. These durable tools are made to fit large mower models that are too heavy to lift by hand. They lift using a hydraulic unit and a simple handle. This eliminates the need for manpower and does the heavy lifting for you. 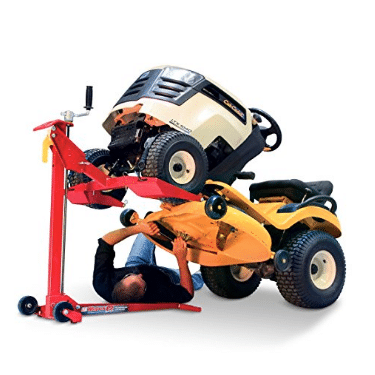 While all mower lifts are slightly different, they all have the same basic components and get the same job done. Most will either have a pumping or cranking handle or a lift pedal used to activate the hydraulic unit that lifts the mower. Oftentimes they have wheels that can lock in place so the lift can be stored and brought out whenever needed. First the mower will be moved onto the lift and the wheels locked in place. Some lifts come with safety straps that can be used to further guarantee the vehicle’s safety while on the lift. Once secured in place, use the handle or pedal to manually lift up the mower. When the desired elevation is reached and the underside of the mower is accessible, it’s time to lock the mower in place to finally secure its placement while you work. There will usually be locks or pins to make this happen. Once finished servicing, essentially the same steps are followed in reverse to lower the mower and remove it from the lift. It’s as easy as that! If you’re well versed in mechanics, you can save a lot of money by simply buying your own lift and working on repairs at home. There are different kinds of lifts for the different kinds of lawn mowers on the market, and determining which one to use requires knowing the weight of the mower. A push mower usually weighs about 100 pounds. A riding mower is anywhere from 300 to 500 pounds, with a zero turn mower at the high end of that range. Lifts are usually classified by their lifting power. It’s important to be sure that whichever lift you purchase has a lifting range that exceeds your machine’s weight, just to be safe. A larger riding mower or a zero-turn mower (ZTR) will require durable lifts that can take on heavy loads, anywhere from 500 to 750 pounds. Be sure to double check the lifting capacity and match it with the mower you have to ensure an easy and safe lift and repair. If you are in need of a jack for a motorcycle instead of a mower, check out our list of the best motorcycle lifts for Harleys.